Want to know how to ride a horse western style? If you’re into Western horseback riding, then this is how you do it. 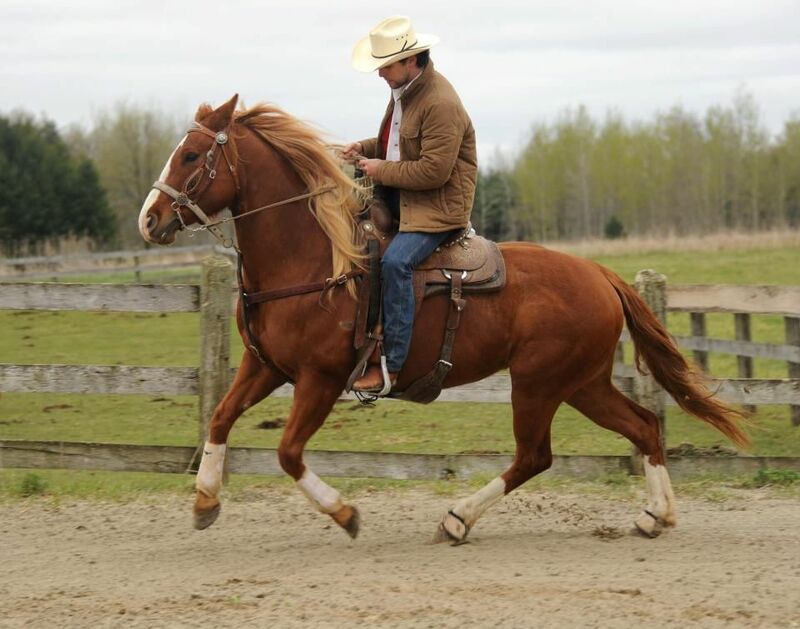 Check out these tips to learn how to ride like a cowboy! YEEEEHAW! There are two ways to ride a horse: English riding and Western riding. The noticeable difference is with the saddle. Western uses a bigger and heavier saddle which makes riders feel more secure. This also lets the rider sit differently. When you compare English to Western side by side you will notice the riding posture is actually quite different. I’ve been around horses a lot in our farm and have practiced riding English and Western and honestly, I love riding Western better. You can do it with one hand and it’s the best riding style when ranching. So if you want to know how to ride a horse in a more laid back fashion, then keep reading this tutorial! Put the saddle pad on. It should be at least an inch to one inch and a half thick. Your horse should be comfortable. Remember that Western saddles can weigh up to 50 lbs. Add your saddle blanket! This makes the experience a little more cozy for you, and especially for the horse. Carefully set the saddle up and lay it down your horse. Once you have it on, check both sides to make sure that it is lying flat and that the saddle pad is even on both sides. Start with the front cinch, securing it snugly to your horse. Now that you’re done with the front, start securing the back cinch. Make sure that it has just the right looseness – you should be able to fit your hand in. Check that the saddle is aligned with the horse’s shoulder and positioned evenly. Step 5: Time to Ride! Now that you have your horse saddled up, next thing to do is to ride it. To mount your horse, hold the saddle horn then place your left foot in the stirrup bar. Then with an upward movement, bring yourself up centered in the horse. REMEMBER: Sit lightly in the middle of the saddle. Make sure that your ear, shoulder, hips and heel are aligned when sitting up. You can hold the reins with two hands or one. The Western riding prefers one hand but you can pick which method you’re comfortable with. If you want to do it with two hands, make sure that the reins are even. Hold the rein between your pinky with your thumb on top. For a one-handed hold, begin by making sure that the reins are even. Then depending if you’re left handed or right handed, hold the reins with one hand with your thumb on top. To start walking your horse, keep your heels down and squeeze gently. To transition from a walk to a jog, click your tongue and squeeze the horse gently. This will signal your horse to start jogging. REMEMBER: Always face the direction of where you want to go. There are two ways you can bring your horse to a halt depending on how they are trained. For the squeeze-stop method, put both spurs in and this should put your horse to a halt. And that’s how you ride a horse Western style. Always have the proper attire when riding. If you’re a beginner, I’d highly recommend a riding helmet first before transitioning to a good old cowboy hat. Have fun and enjoy! What do you think of this tutorial on how to ride a horse? Let us know in the comments section what your thoughts are on this Western style horseback riding. Do you think you’ll give it a try? Let us know how it went and share your experience with us in the comment section below. There are few images that represent the American spirit better than wild mustangs. Freedom, toughness, tenacity, romance, and beauty: wild horses embody all of the things that Americans associate with the birth and growth of our nation. It might be surprising, therefore, to learn that the wild horses of today’s American West are not descended from native horses at all. At least not directly. The first true horses like those that we have today, Equus caballus, appeared in North America about a million years ago. They evolved from ancestors that looked nothing like horses and were the size of small foxes. From North America, Equus Caballus migrated over land bridges into South America, Europe, Asia, and Africa (Edwards, 1995). Have any homesteading projects you’d like to share? Share it with us and we’ll give it a try. We’d love to know what you think!